Since we were heading out of town the day after we got our latest CSA box we knew we had to use anything that would go bad while we were away right away. Luckily most of the items in this box would save until we got back 6 days later. I wasn't so sure about the curly endive but wasn't sure what to do with it. Luckily the newsletter we get with each box had the recipe for this salad in it. Ok, believe it or not I have never had a salad with a poached egg on it before. Matt said it was definitely time to change that. This is pretty much your basic warm bacon salad but it was so good I thought it was definitely worth sharing. With a nice glass of wine this made a perfect light dinner but it would also make a great lunch or brunch. If you don't have curly endive substitute spinach or spring greens. Heat 1 T of the olive oil in a frying pan. Add the bread cubes & toss to coat. Season with a little salt & pepper. Cook the bread in the pan until it is crisp & brown, stirring frequently. Remove & set aside. Add the bacon to the hot pan & cook until crisp. Remove the bacon to a paper towel to drain but keep 2 T of the bacon fat in the pan. Mix the bacon with the endive in a heat proof bowl. Bring a saucepan of water & 1/2 t of vinegar to a bowl. Slip the eggs one at a time into the boiling water & cook until the whites are set but the yolk is still runny, about 2 1/2 minutes. Use a slotted spoon to move the eggs to paper towel to drain & season them with salt & pepper. While the eggs are cooking, add 2 T olive oil, garlic & thyme to the frying pan. Cook until the garlic just starts to turn brown. Add 1 1/2 T vinegar & remove from the heat. Toss the hot dressing into the endive & bacon, the endive should begin to wilt. Toss in the croutons. Divide the greens between two serving dishes & top each with an egg. 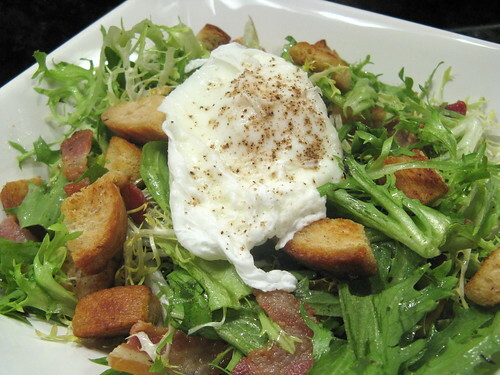 Frisee & Lardon Salad w/ an egg on top. Very French and our favorite salad! I add toasted walnuts to this yummy first course! Adding a poached egg is a great way to make a salad into a meal-- I'll have to try it. Sadly, the only greens my husband will eat is lettuce! This is absolutely one of my favorite salads, eaten from Paris to my kitchen! Yours look terrific. And now I know what's for lunch. the first thing I want to eat after I have this baby is a nice egg with a runny yolk. Oooh, how this salad sounds like a bit of heaven right now!! mmm love the poached egg. Agree with Stacey, making me think of Paris. Anything with a runny yolk oozing all over it is a winner. I've never had a salad with a poached egg on top either :). This has to be good! Bill - I think we used more bacon fat than olive oil in the dressing in the end & that added to the flavor. Stacy & Giff - I did feel very French with this dinner & my glass of Cote de Rhone. This sounds like a satisfying yet lightweight dish. I have to give this a shot. 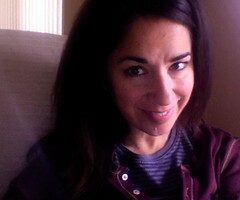 On Foodbuzz I filled in on the question: My favorite food: Softly Poached egg on sourdough bread! This salad is as close as you can get + the greenery for the conscience. Good Stuff! perfect! we got curly endive in our csa box, and have also been unsure what to do with it. i got my husband a "poached egg spoon" for christmas, and since then, we've been having poached eggs quite often :). been to your site before (via google recipe searches)... glad it led me back so i can now bookmark it.